If you really want to stump music freaks ask them to name a couple of Italian composers whose names do not end in i. If they are good they might begin with Giovanni Pierluigi da Palestrina, mention Giovanni Battista Fontana and then point out that French composer Jean-Baptiste de Lully (originally Giovanni Battista di Lulli) are three. After that it's definitely uphill. At last night's (almost secret pre-concert concert) of the Pacific Baroque Orchestra's season held at St James Anglican on Cordova (that very same concert will be repeated today at St Augustine's in Kerrisdale and tomorrow at West Vancouver United Church) the interesting program featured 6 Italian baroque composers and one, in this day and age, almost unknown German, Georg Muffat. Fully 50% of the Italian composers had names that did not end in i! There was Alessandro Scarlatti (father of the better known Domenico), then Arcangelo Corelli and Giuseppe Valentini affectionately known as the Little Ragamuffin. But the other three featured composers were the ones that were unexpected for their definitive lack of that final i. Consider Alessandro Stradella (murdered at age 37), Francesco Durante (singly responsible for creating the first viola joke and told very well by the soon to be mother, Glenys Webster and fellow jokester Mieka Kohut) and the very Roman Giovanni Zamboni Romano! Aside from the odd names of mostly unknown composers (but not lacking in originality and or virtuosity) the concert was full of real and most pleasant surprises all improved by the vision of being able to scrape the filling off some Oreos accompanied by tea in the parish hall during the intermission. 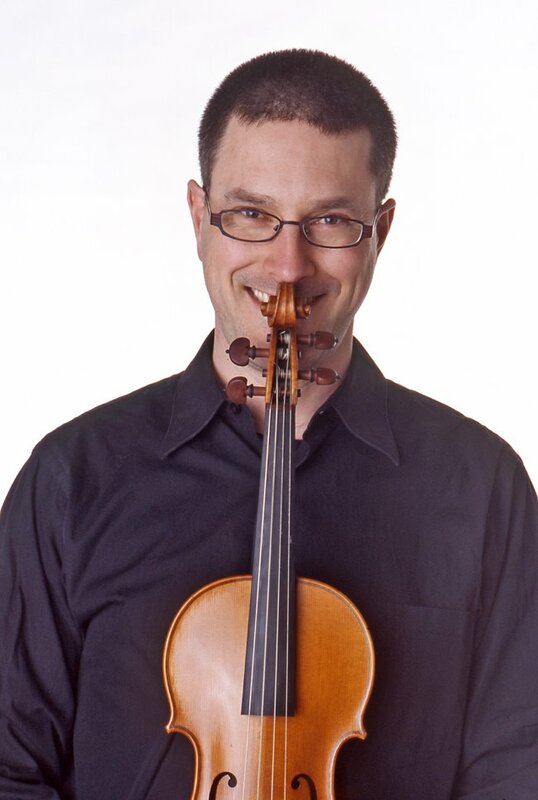 The thematic of the concert seemed to be weighted by murder (Scarlati's piece was his introduction to the oratorio Cain, or The First Murder), or knowledge that the composer Alessandro Stradella had been brutally murdered, buffered in between, by the soaring music of Arcangelo Corelli who may or may have not levitated while playing his violin at church. For me there were two high points. There was an astounding six-voice fugue in the second movement of Giuseppe Valentini's Concerto in a minor for four violins, Op 7 No. 11 that from my vantage point on the first row seat, three feet from violinist Paul Luchkow (seen here) which even made my otherwise blasé wife Rosemary sit up and notice because it was so beautiful. 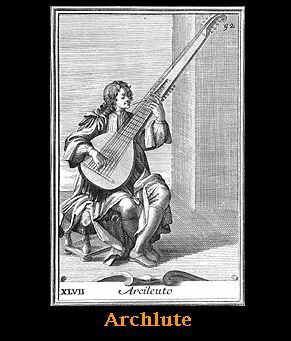 The other peak happened when guest leader, archlute and baroque guitar player, Luca Harris sat down to play his huge (extremely long) archlute which is sort of like a bass lute. It's bass notes stretched towards the church ceiling and every time he played that G string my whole body resonated (might I have levitated just a bit?) at its sound. It is a sound that rivals that of a bass trombone or a beautifully played Guarneri del Gesù. It is not often that one gets to hear an archlute solo (Sonata in G major from Sonate d'intavolatura di leuto, Op 1) by Giovanni Zamboni Romano. Harold Pinter wrote his first play, The Room in 1957. One year later my English teacher at St Edward's High School, in Austin, Texas, Brother Dunstan Bowles C.S.C (Congregation of the Holy Cross) was reading the play to us in class and telling us of this "exciting and new" playwright. I have my doubts that the conventional school sytem of the city and its English teachers even knew of the significance of eventual Nobel Winner (2005) English playwright. The reason we knew is that our school (which just happened to be a Roman Catholic school) had extraordinary teachers and we obtained an extraordinary education. Many of those teachers linger in my heart and they are a combination of all the talents (and perhaps a few of the faults) of English teacher, Hector ( played so beautifully by Bernard Cuffling) in Bennett's 2005 play The History Boys. We saw it performed by the Arts Club Theatre Company at the Granville Island Stage on Wednesday. The History Boys has some of the good points (a few) of the James Bridges 1973 film The Paper Chase, and even some good ones (very few) from Animal House . Best of all this cerebral play has in Bernard Cuffling not that stuffy Houseman (John) but one who can freely quote the other Housman, A.E. The 8 likable and fairly well adjusted young boys (almost men) of the Sheffield grammar school in the 80s brought me fond memories of 11 boys I had met and photographed back in November 1983 at St. George's School in Vancouver. 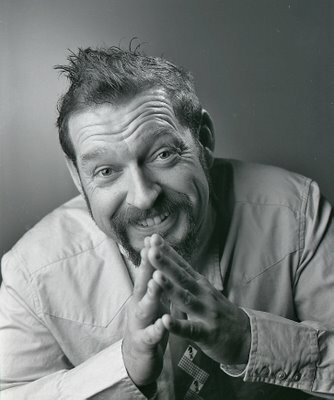 I had been assigned by Vancouver Magazine editor, Malcolm Parry to accompany writer Don McLellan. 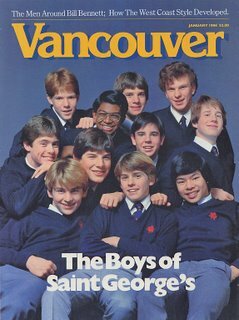 I immediately realized that my take of this premier Vancouver private school was going to be in direct oposition to McLellan's. He had never gone to a private school and I had. He saw the boys as rich and privileged (which they were). I determined then that somehow I was not going to attempt my usual objectivity in my approach of the photography and I was going to make all my pictures of the boys, rosy and pleasant to compensate for the expected ( I never read the article because I was afraid to do so). I was most proud of the cover and years later at my eldest daughter's graduation from York House some the boys (now men) approached me with smiles on their faces. I felt these same emotions of pleasure and excitement of attending a good class with a good teacher in a good school as I watched The History Boys in action. Every single boy was dead on his part and I immediately gave them the names of some of my ex classmates from school. All of the boys, but one, are testicularly groped by Hector while riding with him on his motorcycle to some undisclosed destination. In the end Hector is found out (most knew anyway but looked the other way) and the ending incorporates a tidy one that somehow does not punish Hector for his lapse in morality. It is fate that punishes Hector with finality. As I watched this play I remember a friend whose husband was assassinated (both were very young) during the regime of a dictatorial and military government. My friend has paraded having been the wife of the man and talked about this experience during all her life. She joins organizations that trumpet human rights of the left and close thereof. This is her cause. But she is a modern member of the new left as her credit cards are ready to help her consume. Irwin, Hector's assistant would probably have advised her, "Read about Henry VIII then forget and push on!" If any one of those boys from Sheffield had been living here and had had their testicles groped I am sure we would be paying still for all kinds of treatment, and having to read all kinds of revealing biographies of having to have lived with the shame. Surely both the play and the above paragraph are two extremes. The former one is a laissez fair approach while in the latter it never ends. In Bennett's play everybody gets his eventual reward even the cynical Irwin (played by Irwin, and oh! so handsome when he removes his glasses). Is is touching? Is it symmetrical? Is it, that only the boy who is not groped Posner (nicely played by Daniel Karasik) somehow does not become the success that all his peers become? The History Boys had all kinds of comic touches which I am sure are direct injections from Vancouver's funniest director and one of its funniest actors (watch out Donald Adams! ), Dean Paul Gibson seen above left. As I left home I imagined Gibson playing Irwin and wondered if he would have handled handsome and troublesome Dakin (played with gusto by Charlie Carrick) any better? The History Boys runs until October 25. 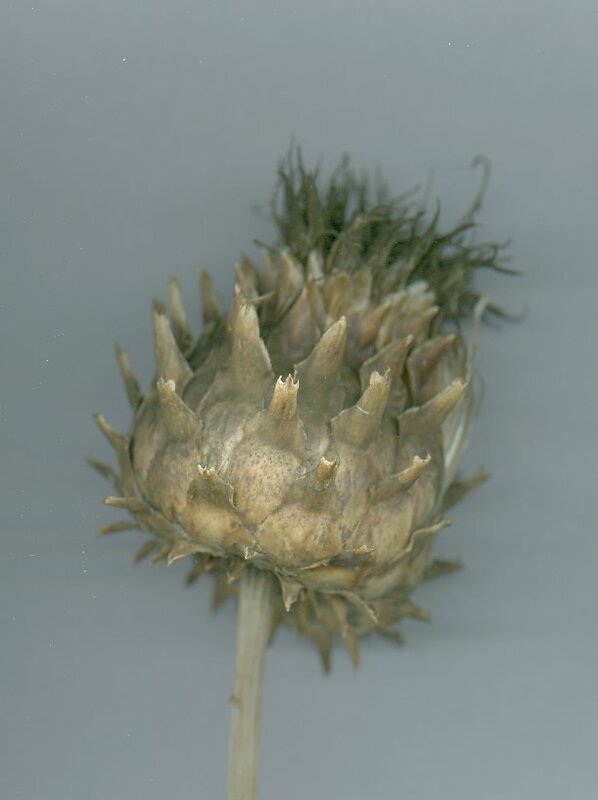 I have written before of Cynara cardunculus. 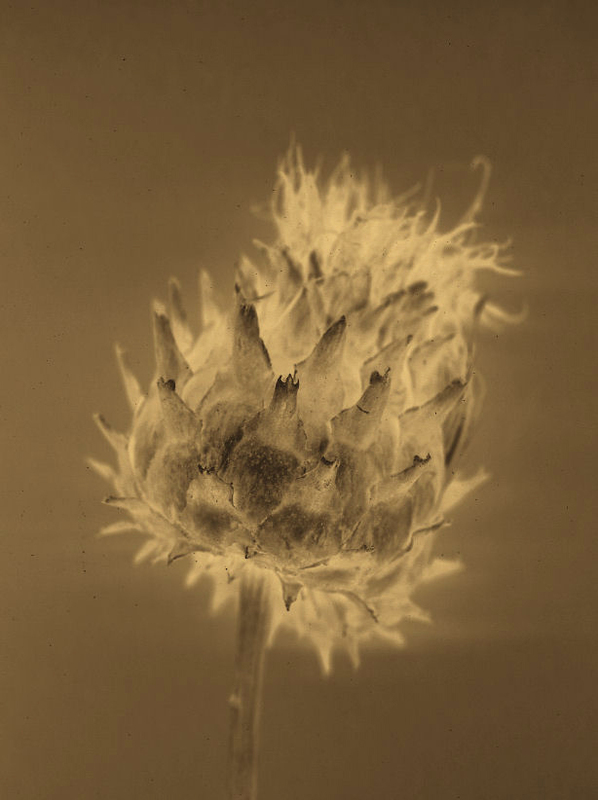 My procupation in recent weeks has been the preparation of my Friday history of photography classes where I use no textbook and I must rely on reasearch, my memory and scanning photographs from my large collection of photo books. Many of the photographs are not to be found in the internet. The idea people have is that if it isn't in Google it doesn't exist. But when I find a photo from my memory I know to the contrary. Today I have been at my computer and scanner all day and my eyes feel rectangular. 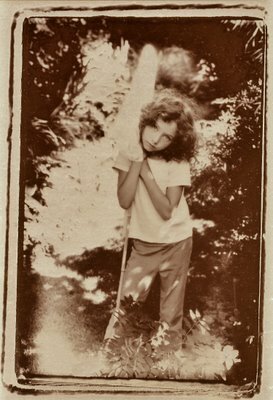 Yesterday as I prepared for today's scanning agony I decided to scan (!) one of my drying thistles and try to see how I could make the images look 19th century. The result upper left started with a straight scan (but with a sheet of letterhead paper on top of the thistle. That's the second image seen here. From there I reversed it so that it became an unearthly blue. I desaturated it (took the colour away) and then made it yellow/red again. 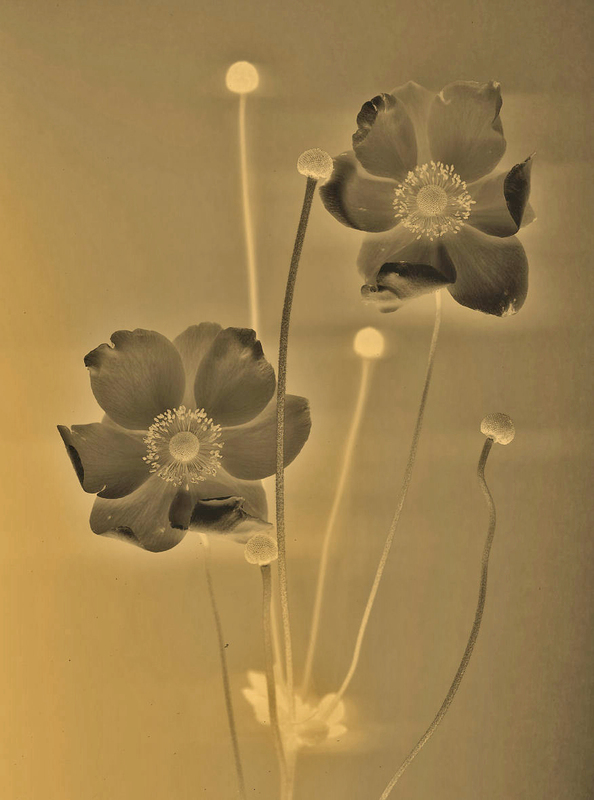 The bonus image is an "antiqued" Anemone x hibrida. My friend C.C. Humphreys actor, swordsman, historical novel author (and books for young people, too) invited me last night for his book launch. 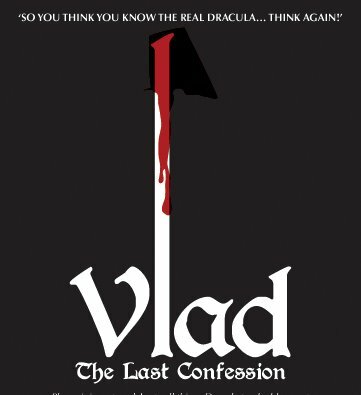 His latest Vlad - The Last Confession (Mc Arthur & Company) is a historical novel on Vlad Tepes (Vlad the Impaler). He told us a story as we drank a blood infused cocktail and nibbled on things red like skewered meat, sausage and salami of all types, at The Cascade Room on 10th and Main Street. It seems he got drunk with his publisher in London as they lay the strategy for the next book. The publisher did not want Humphreys to write a fourth Jack Absolute novel (alas!). It had to be a novel on something completely different. "Who has not been done before? " he asked Humphreys? The publisher staggered to the bathroom and we came back he said, "I've got it. Vlad The Impaler, the historical Dracula." If this novel is anything like Humphreys's dashing Jack Absolute novels I will be starting his latest soon. Humphreys insists that my favourite lore on Vlad Tepes (Impaler in Rumanian) is in the novel. I cannot wait. It seems that sometime around 1459 the Turks demanded that Vlad pay tribute. He refused and waged battle. The Turkish delegation that had been sent to demand the tribute refused to remove their turbans in homage to him saying their religion forbad it. The Impaler had the turbans nailed to the heads of the offending Turks. I doubt that Vlad Tepes might have ever wielded a modern cavalry sabre (it seems it was invented in the 10th Century by the Hungarians) like the one C.C. Humphreys is posing with here for my photograph. But I do think that the added red wash on my original b+w photograph shows that Humphreys might just volunteer for the lead role as soon as his novel becomes the film it deserves to be! 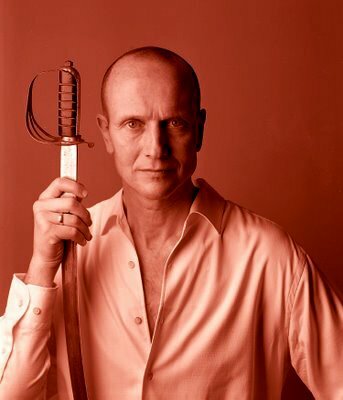 His acting pal Christopher Gaze would be fair game to play his father. I have written about this before, and, in fact used the very same image of Rebecca to illustrate that garden phenomenon when I look at my hostas with their slug holes and I say, "Slugs it's the end of summer. You can have them." In two weeks it'll be the longest day in the year... Do you always watch for the longest day of the year and then miss it? I always watch for the longest day in the year and then miss it." As I started my first fall class at Focal Point the women behind the desk asked me, "How was your summer?" It has been many years (37) since I taught or went to school so this question is particularly meaningless to me and more so since I am a freelancer. I work when I get it and weeks meld into other weeks. Friday and Mondays have no specific image except that traffic is worse when I want to go or leave my studio. The question however has a romantic memory attached to it for me. It brings me memories from the 1974 film The Great Gatsby with Robert Redford (Jay Gatsby) and Mia Farrow (Daisy Buchanan). Sometime by the end of the film Gatsby, smartly dressed in white and with a white straw hat walks the length of a swimming pool with a male companion (I have forgotten whom). It is a bright sunny day and Gatsby says something like, "It has been a great summer." 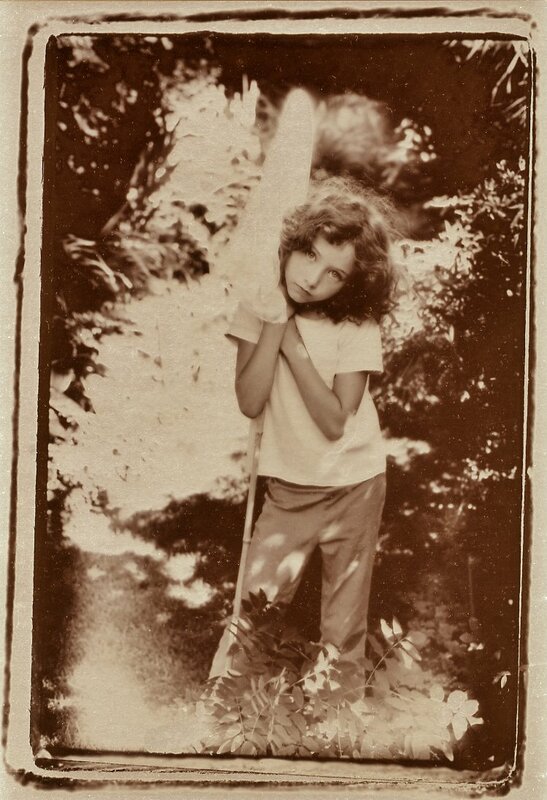 That one statement in that film is full of meaning and more so when I gaze at this picture or Rebecca. Rebecca almost got hit by a car today as she was cycling to the park. A car was going much too fast and did not notice her. Rebecca should have stopped, but she didn't. There was a sober sort of here-comes-winter-and-soon-I-will-be-an-adult-and-things-will-get-serious look. "I don't want that," she might have been thinking as I concurred. On a less sobering note summer reminds me of Argentine colectivos (buses) and how as a young man I noticed that Argentine men would offer seats to women in the summer but refrain in the winter. It didn't take me long to figure out that in the summer, when Argentine women wear very little clothing, the sight from above as a man stood, was far better during that hot season. Some years ago Christopher Plummer was in town and my writer friend John Lekich was assigned by the Globe & Mail to interview him. I pressed Lekich to get me on the set so I could snap a portrait of the actor. Getting permission to enter a set has to go through all kinds of protocols and Lekich failed. I was crushed and it did not help when he told me, "Plummer said he would gladly pose for you the next time he comes to town." I was "collecting" portraits of celebrities. I was crushed. Celebrities of all kinds keep coming to town but fewer great directors and film actors do so with the retreat of the Vancouver Film Festival to whatever vision it is supposed to follow. The celebrities now flock to the Toronto Film Festival, a festival of real consequence. But I am not crushed. I long ago ceased to worry about "capturing" celebrities. Of late I have become most interested in the common man/woman and I revel in taking their pictures. They represent that wonderful and exciting word, potential. Most of my files are in alphabetical order but I have a few that are not. Witness the photographs of two beautiful women here, Colleen Neill (top, left) and Aaron Ainsley (also in colour). 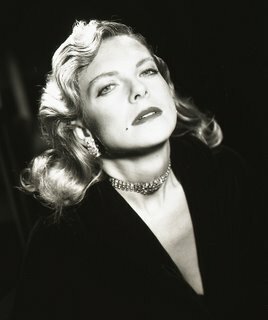 I photographed both at least 20 years ago. They are not filed under their surnames but in a thick file called Glamour. When I photographed them I did not deem them important enough to merit their own files. I am glad I have changed my mind. As of today I will refile them and here they are in all their glory, the beauty of the common woman, the non celebrity, celebrity. 1. A rousing version (the best I have ever heard) of O Canada. 2. Robert Schumann Cello Concerto in A minor, Op. 129 with soloist Lynn Harrell. Harrell performed an encore of the Sarabande from J.S. Bach's Suite No 5 in A minor for solo cello. Harrell's performance was much mellower and less dramatic than the Pablo Casals version I am accustumed to. But it was sweet, nonetheless and most appropriate after the quiet and also mellow Schumann concerto. Wearing what looked like a black Nehru jacket, I thought that at any moment Harrell was going to levitate and float above the floor in ecstasy. 3. Bramwell Tovey's Urban Runway (commissioned by the NY Philharmonic and the Los Angeles Philharmonic for the 2008 summer season). 4. Sergey Prokofiev's Romeo and Juliet: Suite. There was an encore of Edward Elgar's Variations on an Original Theme for orchestra, Op. 36 ("Enigma"), with Variation 9 (Adagio) "Nimrod"
My main interest that evening was the Prokofiev as I have seen the Romeo and Juliet ballet performed twice by Evelyn Hart. As I listened to the music I could imagine her dancing in my imagination. It was beautifully played and I especially liked the sound of the cornet that represented Juliet. But the evening was special for two other reasons. Tovey's Urban Runway to my untrained ears with its jazz sounds (played by what seemed to be a reinforced orchestra) sounded like Gershwin on speed! It was lively, exciting and wonderfully loud at times. No matter how often I listen to Elgar's Nimrod I will never tire of it. It may just be that some years ago as I traveled in a fast train between Crewe and Euston Station in London I saw the miniature landscapes (with miniature clouds hovering over the miniature hills) of the English countryside and I could imagine Elgar's music. The landscape was Elgar. Bramwell Tovey brings with his interest in jazz and love for Elgar a warm sociability to his role as Maestro of our city symphony orchestra. A couple of months ago I had a chance to take his photograph in my studio and we chatted. I asked Tovey who his favourite English composer was. It is Edward Elgar and not because of the pomp and circumstance side of his music which is entertaining these days with the world of imperialism that has fallen away but simply because of the introspection of some of his music. His Engigma Variations and his First Symphony are about an intense personal journey that he underwent from being the son of a piano tuner to being a friend of Kind Edward VII. When he underwent that journey, England was a class driven society, it still is, and he drove through all those barriers with his extraordinary personal talent. He is the most gifted instrumental composer that England has produced. For anybody who reads the NY Times regularly (me!) it would be quickly known that Tovey is beloved by the audience when he directs the NY Philharmonic in the summer festivals there. He is not only valued for his conducting but for his intimate chatter on all things musical (or not). So I asked Tovey if he was an adopted son of New York. I may be an adopted son of New York but I am Canadian now. I am married to a Canadian. I have Canadian children. I regard myself as an adopted Canadian. But in New York, I love the city! I have been going regularly since 2000. I do this summer festival. Opposite Lincoln Center there is this Italian restaurant called Café Fiorello. It has the greatest antipasto bar of any Italian restaurant that I have ever been in. I live in that restaurant. I meet people there for casual coffee, for breakfast for dessert. I find that the whole of New York seems to come through that restaurant. When I arrive at Fiorello's and I have had profiteroles then I feel like a real New Yorker.